Received this in an email from What to Expect. I'm trying to remember this. haha! Basketball Baby Belly and Chubby Cheeks! Matt's favorite picture. He thinks it looks like I'm holding a basketball on my lap! 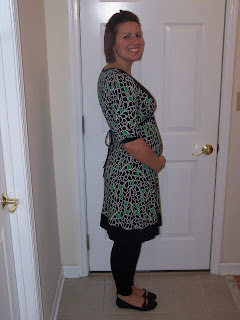 Yesterday we went for our 24 week ultrasound. 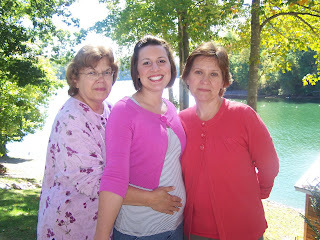 Aimee got to tag along for this one, and we were all pretty excited to see baby Madison. She was so curled up the whole time. Her arms and legs were both all the way up over her head. What a silly baby! haha! (If you look closely in the photo above, you can see part of her leg and foot above her head.) The tech said she was measuring perfectly and she now weighs a pound and a half. 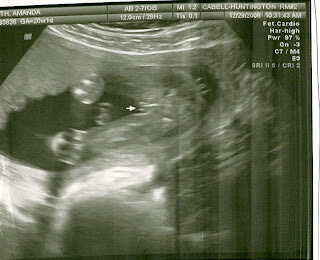 Our next ultrasound is scheduled for February 23rd. 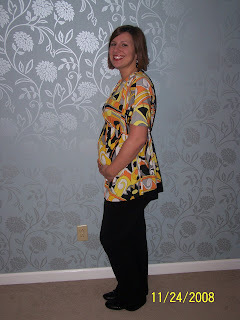 We also found out that I was wrong about the ultrasound schedule after 32 weeks. I thought we had to go once a week, but it looks like we'll be going twice a week. I guess they don't want me going more than 3 days without an ultrasound. It seems a lil scary, but it's comforting that they're being so cautious with our little girl. We've decided on a daycare!!! It's such a tough decision! But I think I'm going to be really pleased with the one we've chosen. Matt's planning on keeping Madison home with him on Fridays as long as his schedule doesn't change. So looks like our baby girl will only be going to daycare 4 days a week. I scheduled maternity portraits for February 28th. I'm really excited about them. I hope they turn out nicely. The photographer I'm using is in Huntington. 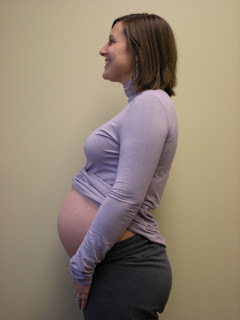 http://www.courtneybellphoto.com/ I realized a few days ago that I no longer remember how I looked before I was pregnant. 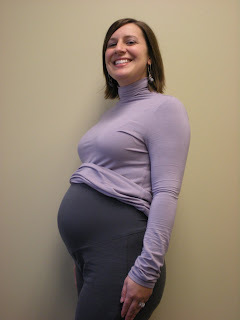 At first, it seemed so weird that my belly was so much larger and my face so much rounder. And now it seems normal! Isn't that crazy? Don't get me wrong, I'll be happy to be somewhat thin again...I just no longer remember how that feels. 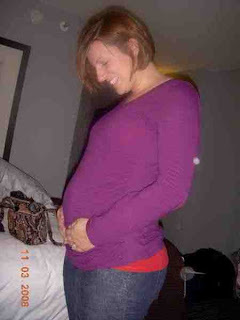 And I love that Matt and I can laugh about how big I'm getting! Matt is fascinated by my almost nonexistant bellybutton. Had an appointment this morning at the Hypertension Clinic, and I get to stop taking one of my blood pressure medications! My blood pressure is doing great and the doctor seemed really impressed with my cardiac output. He thinks the medication they are taking me off of is decreasing my heart rate too much, which could lead to our lil girl not getting enough blood flow. I'm just going to monitor my heart rate over the next few weeks to make sure it doesn't increase drastically. Matt made it home from Texas Saturday. I think he missed us. :-) He started back to work last night. I'm really going to miss spending the evenings with him, but I'm very thankful he's back to work! Matt left at 5 this morning to head to Columbus. He's going to visit family in Texas. I really wish I had extra vacation days and could have tagged along. He was sure to wake me before he left though to give belly and me bye kisses. He'll be home Saturday. In the meantime, belly and I are staying in Man. I can't believe I've been so horrible about updating this thing. I haven't posted a blog in waaaay too long. So much has happened...I guess we've just been busy (at least that will be our excuse!). Lots and lots of appointments - all of which have been just fine. Everything seems to be great with our lil one. 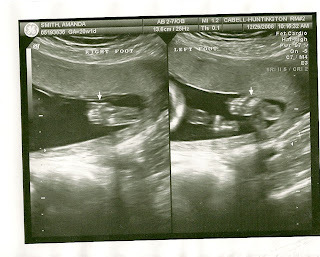 We had our first ultrasound at 8 weeks...we were in awe of the tiny thing on the screen in front of us. We went for our second ultrasound on December 29th. Our little one had grown so much! 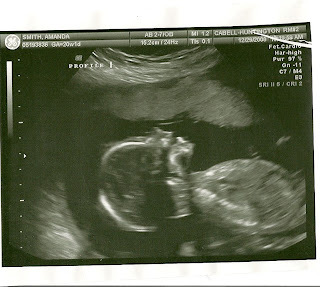 After much poking and prodding, we found out that our little one is a girl! We were amazed by her heartbeat and to see her mouth open and close. Since then, it seems we can't go into a store without going to the baby department. We've cleaned out her room, ordered nursery furniture and baby bedding, and talk about her so often. Matt has even organized her closet! I do believe it's true...a baby does change everything. 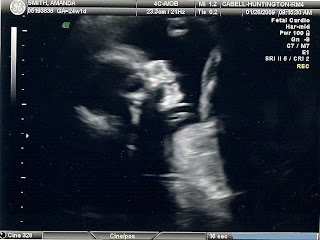 We are so crazy about her already, and she isn't even here yet. I love feeling her move (which she does a lot of). I felt her move for the first time around 16 weeks, and she's been going strong for about 3 weeks now. Matt seems so anxious to feel her kicking...I can't wait for him to feel her too. 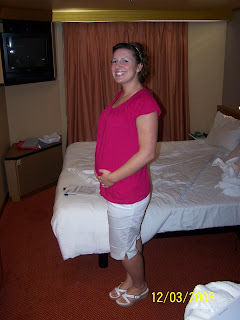 We went on a "babymoon"...a cruise to Nassau, Half Moon Cay, and Grand Turk. It was so nice to just get away and relax. I think one of my New Year's resolutions should be maintaining this blog!